I tried to focus on principles before personalities, but when I did not achieve satisfactory results, I began to hate myself. A woman balancing a boulder against her back. 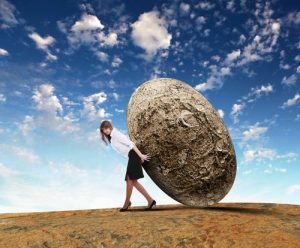 Just like Sisyphus, who repeatedly rolled a boulder up a hill, only to watch it roll down again, I am tired. Sometimes I find my efforts to focus on “principles before personalities” as daunting as the task of Sisyphus, the Corinthian King from Greek mythology. After six and a half years of sobriety, some of the personalities that I meet at various AA meetings disturb me. No matter how hard I try, or how many inventories I have done, or how many meetings I attend, or how many talks I have with my sponsor and other women in the program, I often allow personalities to infiltrate the essence of my being. And just like Sisyphus, who repeatedly rolled a boulder up a hill, only to watch it roll down again, I am tired. For a long time, I believed that AA was crucial to my sobriety. And for a long time, AA helped me stay sober. But I kept asking myself if there were other ways to maintain my sobriety. I thought about looking into other recovery support groups. Guilt overcame me, so I refrained. But then, one day, I took a deep breath and went to a Refuge Recovery meeting in the San Fernando Valley. The group meditation at that meeting made an impact on me. As far I was concerned, that meeting alone was worth 100 AA meetings. I wanted to continue going to Refuge meetings, but as they say, life happens. I had to move, and ended up in a small town in Kern County. Unfortunately, there was only one Refuge Recovery meeting, about an hour away in Bakersfield. I called the secretary to get more information. He told me that he was the only one who attended but he kept the meeting going, hoping that eventually someone would show up. So I decided to stick with AA meetings. In this small town, there are between two and three AA meetings each day, with an average of 19 weekly meetings. Most of the meetings start at 7 or 7:30 pm. I have more choices with the menu at the local Burger King. Finally, I went to a Monday night meeting in the local vicinity. During that first meeting, I felt a sense of comfort: the women gave me their phone numbers, and even the coffee, which usually tastes worse than valerian tea, was delightful. I drank three cups. I ate cookies. Instead of sharing, which I usually do at meetings, I listened. During the break, I chatted with a few AA members, including a man named Paul. At the end of the meeting, I helped the secretary clean up. I told myself that I would go back to the meeting the following week. On Mondays, I had therapy at 4 pm, followed by a visit to Burger King, where I picked up a veggie burger meal, complete with an iced coffee and chicken nuggets for my pooches. I drove to the local lake with my food and walked my dogs between 5:30 and 7. After our long hike, I would go to the meeting. What a wonderful day for recovery! I thought. For my second meeting, the secretary asked me to lead. I was anxious, but I shared my experience, strength and hope. I told the group that the last time I drank I could not stop throwing up. Since then, I get a sense of nausea when I see a bottle of wine or I think about drinking. Perhaps I have become classically conditioned like one of Pavlov’s dogs, I said. When I mentioned Pavlov, I saw a few confused glances in the room. Undaunted, I stressed the importance of doing the steps, getting a sponsor, and going to meetings; the usual spiel. Since I brought up Pavlov’s dogs, I probably mentioned my pit bulls. Usually, when I mention my dogs, I also reveal that I live alone with them. After the meeting, I smoked a cigarette and talked with a woman who had 20 years of sobriety. While we chatted, I noticed that Paul stood several feet away, conversing with a member. Once in a while, he glanced in my direction. After the woman left, I headed towards my car. Paul hovered around like a mosquito. Before I had a chance to breathe, he asked me for my phone number. My response was pathetic. I said, “Can I give you my phone number next week?” Paul blurted out that he was lonely and looking for a girlfriend, and that maybe I was lonely too. He said that he found me deeply attractive, and that he was looking for a relationship. I am surprised that he did not get on his knees and propose. An old-timer within hearing range quickly walked away, as if he were a waiter interrupting a bride and groom eating dinner on their honeymoon. I babbled something stupid and ran to my car, where one of my dogs was pressing his nose against the window with a worried look on his face. Since the Paul fiasco, I have not been to the meeting. Naturally, I have been beating myself up about this. What is wrong with me? Principles before personalities! For God’s sakes, I am not a newcomer! If I see him again, and he asks me for my number, all I have to do is say no! What’s the big deal with Paul telling me that he finds me attractive, and that he is lonely? Why the hell did he suggest that I am lonely? Now I feel like Eleanor Rigby. What a jerk. Stop! Don’t think that way. Love and tolerance is our code. Principles before personalities, remember? What does “principles before personalities” really mean? It means we practice honesty, humility, compassion, tolerance, and patience with everyone, whether we like them or not. Putting principles before personalities teaches us to treat everyone equally. The Twelfth Step asks us to apply principles in all our affairs; the Twelfth Tradition suggests we apply them to our relations with everyone. But I still don’t want to go back to the meeting. Besides activating a past memory, my experience with Paul triggered the mixed feelings that I have about AA. In the past, I have allowed many personalities that I have encountered at meetings to creep into my psyche. I tried to focus on principles before personalities, but when I did not achieve satisfactory results, I began to hate myself. I don’t go to meetings to beat myself up. It’s all about recovery, right? But, after six and a half years, I am sick and tired of meeting jerks aka personalities at AA meetings. There are many of them out there. Just go to an AA meeting and I am sure that there will be at least one person there who will rub you the wrong way. And for myself, recovery is about finding a haven, somewhere that I feel safe. While I know that there are personalities at all meetings, the meditation that I experienced at the Refuge Recovery meeting some years back left a long lasting impression. When I left that meeting, I felt a sense of empowerment. For the most part, I do not feel inspired when I leave an AA meeting. When I left that last Monday night meeting, I felt as empty as a flat tire. Lately, I feel deflated out in the real world. I don’t need to feel that way at a meeting, too. In the meantime, I have been meditating, taking long walks with my dogs, writing, and going to therapy. Oh, and I have no intention of drinking, nor do I want to. Within the next month or so, I plan to move back to civilization. I’ll be able to return to a wide selection of Refuge Recovery meetings. In the meantime, I will call the Bakersfield secretary and ask if that particular meeting has attracted some other interested parties. If it hasn’t, maybe I’ll be the first.